So fresh and delicious! 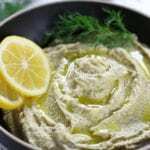 This Mediterranean Lemon Hummus is perfect as an appetizer with veggies, pita chips or your favorite healthy chip. My family adores eating this in sandwiches too. Add first 5 ingredients to a food processor and process for about 1 min. Using the pouring spout of the food processor drizzle in lemon juice while processor in running. Sprinkle in salt and dill and process until smooth.